THIS has made our year. Love at first sight does exist! After countless rejections, our utterly gorgeous Lenny the lurcher has a home of his own, with the delightful Sally and Paul. They love sighthounds as much as I do, and when they saw Lenny it really was love at first sight. 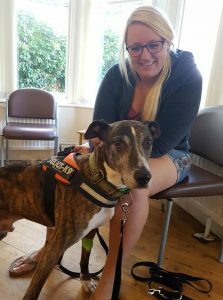 Today Lenny went home, to his own sofa, his own family. Its been an emotional day, but the tears have been joyful ones. Master Lenny, meanwhile, is sleeping off his visit to the vet…. Good luck, Lenny boy, be happy! This entry was posted in crews-news, latest news. Bookmark the permalink.